No camping or cycling was possible in these gales. We sat it out in a bunkhouse in the small port, drinking whisky and swapping tales while the storm raged outside, just like the old Gaels in smoky crofting cottages and black houses. The bunkhouse was quirky, bright and cheerful. Further down the road was a house that anything but. It stood abandoned, its concrete streaked with dirty grey, windows open to the elements. Sheep wandered in and out of the garden, using the walls and house as shelter from the wind. The rear of the house was poor condition. Water sluiced down the walls and through a semi-collapsed roof. The floor was waterlogged and spongy with rotting detritus. Wall paper peeled away, carpets squidgy with mold and mud, plaster disintegrated. I began to feel uneasy in the sitting room and it was not just down to the wind sighing with despair through the windows. The sites I had previously explored were impersonal in their abandoned nature – factories, churches, warehouses and tunnels. This place was once someone’s home. I was intruding on something personal, intimate and domestic. In the sitting room there was a desk with a view over the hills. 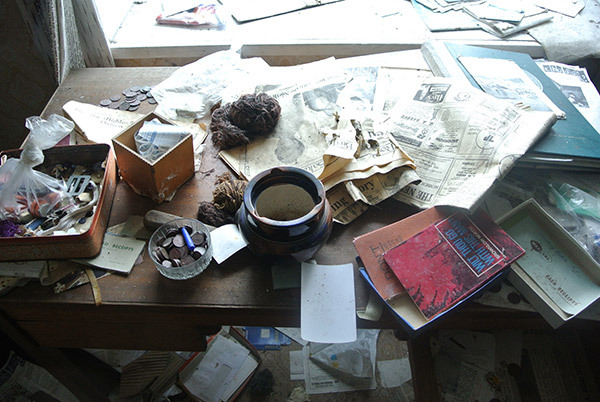 On the desk there were cash receipts, a bowl of pennies, newspapers and books. Someone’s boots stood neatly by a stove. Who was the child in the picture on the mantelpiece? My unease increased as I walked through the rooms. The atmosphere was of the aftermath of a catastrophe that exploded and whose winds forever scattered the occupants. Drawers violently pulled open still full of clothes. A belt coiled on the dresser’ lying next to a hairbrush. A suitcase packed and then flung open, its content scattered across the floor including personal documents and hand-written letters. My unease turned to fear. Something seemed to crouch just beyond the corner of my eye. I gathered myself and explored the final rooms. Everytime I turned a corner I expected to see something crouching in the corner, weeping and watching me through its fingers. Instead there were beds with burnt mattresses heaped with possessions that were once bought and collected by someone. 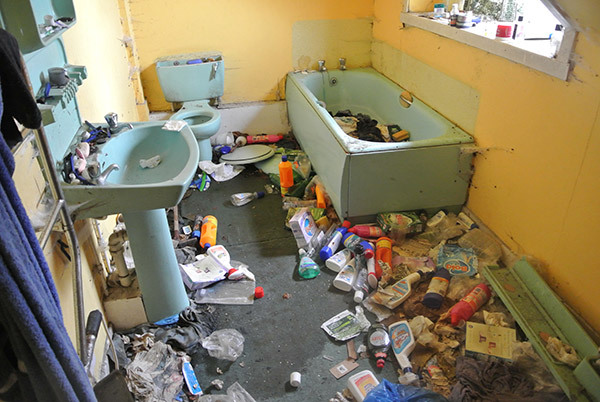 There were shaving razors, soaps and toothbrushes on the sink and a load of clothes in the bath. The bathroom, the house, was full of questions. Why were there so many empty detergent bottles lying around? Who did fold those clothes so neatly on the banisters? A newspaper lay on the floor dated March 2008. Had many people entered the house since then, turning through its possessions, pilfering, burning? The denim and clothes seemed relatively new and ironed, yet parts of the house were open to the terrible weather and uninhabitable. The Hebrides are scattered with houses and crofting cottages that may be abandoned due to certain circumstances, but still hold strong emotional ties with their owners, often to the point where they cannot bear to sell-up and will still visit on annual pilgrimages. I wondered if the owners of this house ever returned, or if indeed there were actually no questions to be answered, just a mind spooked by clothes, solitude and the wind? I stepped back out and staggered through gales and rain. Time to leave the house, join the others and travel north to the mountains. 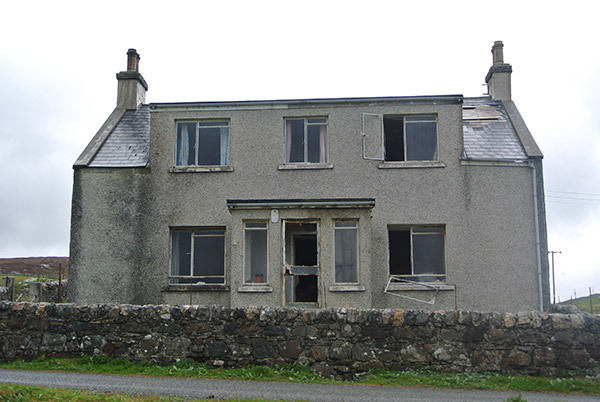 A’ Fàgail na Dachaigh | Leaving Home: why there are so many derelict houses in the islands? Hi Rajiv – have you accidentally unfollowed me? Enjoying your photography experiments. Thanks SI – these abandoned houses are quite common across the Western Isles with changes in population, transport (where road has overtaken sea and left houses stranded) and lifestyle. A house full of questions right enough. Would love to know what the circumstances were which led to its abandonment. Can appreciate why it would be spooky! Lovely piece. I’d like to go there one day. What it reminds me of most is Samson in the Scilly Isles, at the other end of Britain; the only deserted but previously occupied island I have visited. Although here it’s been abandoned for over a century – far too long for personal effects to have survived. The boat drops you there and you have a couple of hours or so to explore. Roofless stone cottages, disused wells, a view across rocky outcrops to the Atlantic – and an atmosphere I have not experienced anywhere else. Thanks duncommutin – interesting to hear about your experience at the other end of Britain. The interesting thing about the Western Isles is of course the Gaelic culture and language which gives it a unique feel. The weather can be awful though. Not for everyone – some people love it, others would not. Some echoes of the second part of ‘To the Lighthouse’, ‘Time Passes’ – a very evocative post. Thanks Paul – To the Lighthouse is on my reading list so those echoes will push it to the top. Abandoned family homes are definitely more intense than abandoned businesses/public venues. I once explored an abandoned house in rural Michigan and it still haunts me – it was as if the family just up and left during a meal. Dirty pots and pans were on the counter. Canned food in the pantry. Vintage clothes were strewn about. We even came across the eviction letter dated 1945. It amazed me that the place hadn’t been looted or taken over by the homeless, but it was so far from any city. I wonder if it still stands, virtually untouched except by time and the elements. You really do wonder what happens and what the story is with these places but that sounds like a straight eviction although the landlord must not have received any further returns on the property. I guess if you are abandoning a home you are not going to bother with the washing-up! Thanks for sharing that. 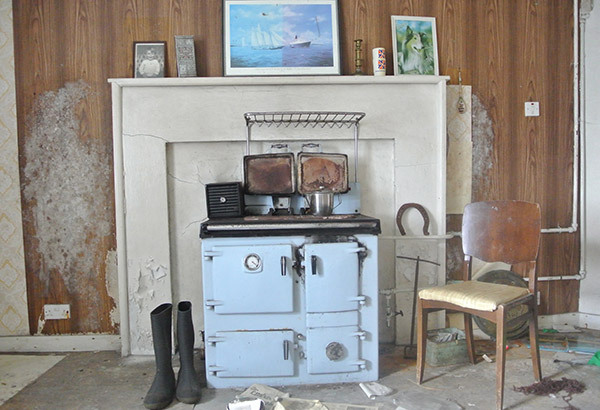 Abandoned homes retain traces of habitation much more strongly than other kinds of buildings. And this comes across very strongly in your post. Thanks! Thanks dobraszczyk – you are quite right to point that out. Glad I got that across in the post. I agree with Paul B, very reminiscent of the second part of Woolf’s “To the Lighthouse” … also put me in mind of “Rodinsky’s Room” by Rachel Lichtenstein & Iain Sinclair. In some respects I think the newness of abandonment can be more spooky than something decades older or more decayed. 2008 isn’t so long ago, and so the unexpectedness of finding something seemingly new, like the neatly folded clothes, amidst the older, more apparent signs of decay and abandonment would be certainly unnerve me too. Rodinsky’s Room! Of course – there are indeed echoes of that. Really must read To the Lighthouse in light of the comments. Agree that it is the newness that disconcerts, as well as the intimacy of the domestic setting. There was a local paper dated from 2008 which suggests how recent this abandonment was. We have the same situation here in Brittany. Many old stone homes left abandoned – some are even decorated over Halloween.. I have several pic. of an old half demolished stone home that was decorated in flowers and odd bits and bobs for this year’s Halloween fete.. It was really quite spooky. The stone homes are called longeres. That’s a very interesting thought, that abandoned houses in Brittany are decorated for Halloween. I bet that provides a spooky frisson for the local children. Thanks for that comment E.D.